This 1752 map by Nicholas Scull and George Heap illustrates the important place early mansions held in the city's history. Only one civic building is denoted, the courthouse at Second and Market Streets, but numerous prominent estates are identified. Most of these mansions have since been lost but some, like James Logan's Stenton in what is now the Logan neighborhood, remain standing. Scull and Heap's map was reprinted many times through the latter half of the eighteenth century with occasional updates. While the city grid system is shown extending the entire distance between the Delaware and Schuylkill Rivers, the city itself would not reach this extent until the nineteenth century. The city's oldest surviving home is Stenton, the country mansion of James Logan. Logan arrived in Philadelphia in 1699 as William Penn's secretary. Two years later, Penn returned to England and appointed Logan the new commissioner of property, the first of a number of political offices he would hold. In 1723, he became mayor of Philadelphia. That same year, he began construction on Stenton, which was completed in 1730. The house is an early example of the Georgian architecture that would come to dominate the city during its colonial days. In 1777, Stenton was used as a headquarters for George Washington's Continental Army. Washington remained at the estate only briefly. It was occupied by the British General Sir William Howe in October of that year, just days before the Battle of Germantown. During the British occupation of Philadelphia, Stenton was nearly burned, but was reportedly saved by the Logan family's former enslaved housekeeper. Stenton remained the property of the Logan family until it was purchased by the city in 1910. Today it serves as a museum. James Macpherson of Scotland built Mount Pleasant with the fortune he earned as a privateer. On his retirement in 1761, he purchased two plots of land overlooking the Schuylkill River and contracted master builder Thomas Nevell to build his home. Macpherson only resided in Mount Pleasant for a few years before a string of misfortunes prompted him to leave the city. He leased his home to several prominent members of society before selling it to General Benedict Arnold and his new wife, Peggy Shippen, shortly before Arnold plotted to aid the British in the war. The city purchased the estate in 1869 and restored it in the twentieth century. Today it is considered one of the best surviving examples of Georgian architecture in Philadelphia and remains largely unchanged. Some of the mansions in the Philadelphia area have been home to the same family for generations. Shipping merchant John Craig purchased a large plot of land in what is now Bensalem, Bucks County, for his summer retreat in 1795. He was likely influenced by the devastating yellow fever epidemic that killed his father two years prior. Here he built his estate, named Andalusia after the region in Spain. The house was bequeathed to banker Nicholas Biddle, Craig's son-in-law, in 1814 and has remained home to the Biddle family since then. Andalusia has undergone several expansions in its over two-hundred-year history and was worked on by two of the country's best-known architects. 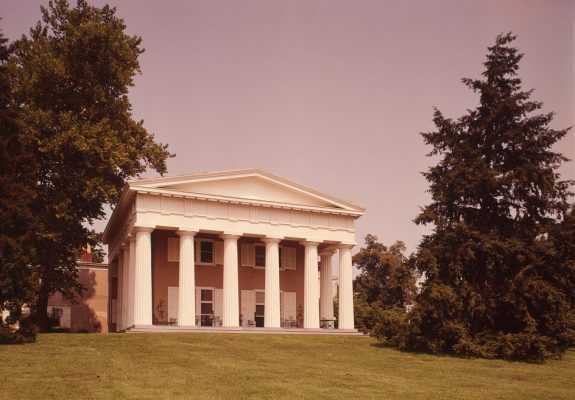 An 1806 addition was designed by Benjamin Henry Latrobe, who is credited with popularizing the Greek Revival style in America and designed portions of both the U.S. Capitol and the White House. The Greek Revival portico shown here is part of a major addition designed by another architect of the U.S. Capitol, Thomas Ustick Walter. The interior remains largely unchanged from its earliest days. In the early twenty-first century, the Biddle family was offering tours of the estate, which had become a popular venue for weddings. The Ebenezer Maxwell Mansion in the city's Germantown neighborhood is a typical example of the city's Victorian suburban homes that historian John Fanning Watson called “fancy cottages for city business men.” Maxwell was, in fact, a city businessman who worked as a dry goods agent trading textiles. 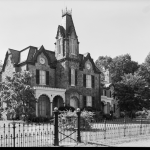 He and his wife, Anna Smith, moved to Germantown around 1857, renting for two years before their home was completed. They lived in it only three years before building a larger home. The home gradually fell into disrepair, especially during the decades that it was occupied by a reclusive resident who barricaded the ground floor and allowed the property to become overgrown. Neighbors began calling it the 'Addams Family House' in reference to Charles Addams' popular cartoons. In the 1950s, the home was nearly demolished for a gas station, but was saved by preservationists and restored using the Maxwell family's estate inventory as a guide. It is now a museum. Anthropologist and tile maker Henry Chapman Mercer began construction of his Doylestown mansion, Fonthill, in 1908 when he inherited a wealthy relative's fortune. Mercer studied law at the University of Pennsylvania and was admitted to the bar, but never practiced. Instead, he spent the 1880s traveling Europe and the Middle East, collecting artifacts and studying local cultures. On his return to Philadelphia in 1891, he was made the curator of American and Prehistoric Archaeology at the University of Pennsylvania Museum, a position he held until 1897. Mercer was a major proponent of the Arts and Crafts Movement and founded the Moravian Pottery and Tile Works to revive the traditional art of redware pottery. Philadelphia architect Horace Trumbauer built Whitemarsh Hall in Springfield Township for Edward T. Stotesbury, a prominent investment banker. Stotesbury was born to a middle-class Quaker family in 1849 and received a limited education, but showed a great talent for finance. He began his career working for Drexel & Co., a banking firm later merged with J. P. Morgan. He was made a full partner at J.P. Morgan in 1883. Over the course of his career he amassed an estimated $100 million fortune, making him the wealthiest man in Philadelphia. Stotesbury lived in a large Rittenhouse Square townhouse until his second wife insisted on a larger space to entertain members of high society. Stotesbury contacted Horace Trumbauer, who had previously renovated their Rittenhouse Square home. Trumbauer was a prolific architect whose designs still stand in the city and it suburbs. He is perhaps best known today for his Beaux-Arts works including the Philadelphia Museum of Art and the Central Branch of the Free Library of Philadelphia on Logan Square, but also gained a reputation for designing suburban mansions for “robber baron” clients. Whitemarsh was completed in 1921 for a then-staggering cost of $3 million. With 147 rooms, three elevators, and approximately 100,000 square feet of space, the home was often compared to the palace at Versailles. It was run by a staff of seventy and frequently hosted hundreds of people for afternoon teas and dinner parties. 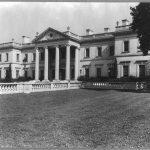 During the Great Depression, and in no small part due to the couple's lavish spending habits, Stotesbury's fortune declined. At his death in 1938, he was worth $4 million. His widow sold the estate in 1943 to the Pennsylvania Salt Manufacturing Company, which converted it into a laboratory. After the company's departure in 1963, the estate stood vacant for almost two decades and became a target for vandals and arsonists. In 1980, it was demolished for a new housing development. 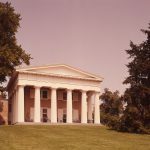 Some architectural features of Whitemarsh Hall, including the columns from the portico, the main gatehouse, and sculptures, were not demolished and remain a visual reminder of the site's Gilded Age glory. Since the earliest European settlement in the seventeenth century, but especially from the eighteenth to the twentieth centuries, large houses constructed by elites in the Philadelphia region provided agreeable places to live that demonstrated social status. As architectural fashion and geographic distribution changed, mansions served as conspicuous symbols for elite Philadelphians and were a salient element of the city’s urban fabric, its surrounding countryside, and ultimately suburban estates. As prominent features of Philadelphia’s built landscape, in the late twentieth century mansions reflected the city’s relative decline. Preservation efforts directed at salvaging these buildings had the dual function of protecting the region’s material history while also, intentionally and unintentionally, reinforcing a version of history that emphasized its wealthy, white, elite, and patriarchal character. 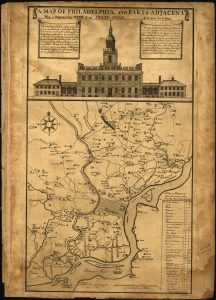 As a result, mansions, which have defined the Philadelphia area’s social, economic, political, and cultural life, became vital to the way the region thinks about its past, present, and future. Mansions have served as town and country housing for some of the region’s leading families for several centuries, helping to define architectural style, construct social life, and structure commercial and political practices. Pennsbury Manor, constructed for William Penn (1644–1718) along the Delaware River about twenty-five miles north of Philadelphia, provided the earliest effort to recreate English genteel life. Other well-to-do Philadelphians followed suit, building houses in the city and its surrounding countryside. 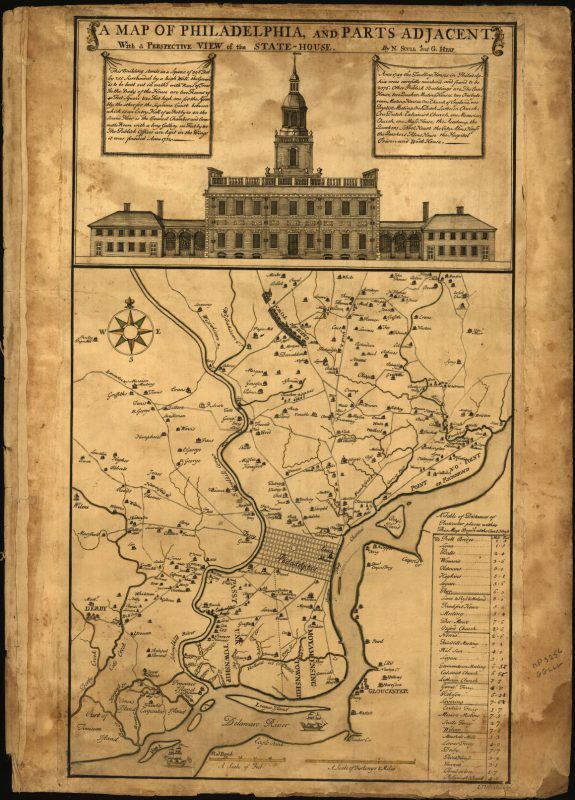 The map by Nicholas Scull (1687–1761) and George Heap (1714–52), originally published in 1752, noted the location of “the most Remarkable Places” in and around Philadelphia, including many houses later termed mansions. Perhaps unsurprisingly, these mansions clustered along the Schuylkill and Delaware Rivers above the city of Philadelphia. 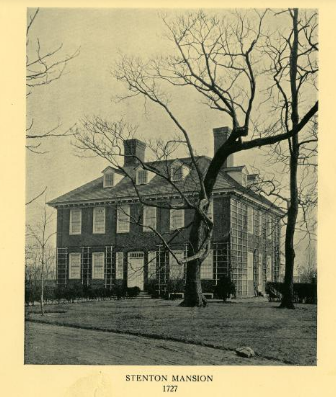 Construction of mansions therefore took place in close proximity to Philadelphia, highlighting the importance of town-centered activities such as trade and commerce to many of the region’s colonial elites. At the same time, their rural location away from the built-up area of early Philadelphia provided what was thought to be a healthier setting. Mansions have also always been a significant feature of Philadelphia’s urban fabric. From the origins of the city, leading citizens erected mansions. A noteworthy example was the Slate Roof house built for Samuel Carpenter (1649–1714) on Second Street (1687, demolished 1867), which William Penn lived in for a time. Before the American Revolution, figures such as Samuel Powel (1738–93), the last mayor of Philadelphia under British rule, constructed large brick townhouses that functioned as dwellings. Their plain exteriors often belied elaborate interiors. An important mansion built by financier Robert Morris (1734–1806) and lived in by Presidents George Washington (1732–99) and John Adams (1735–1826), was the President’s House (1767–69, demolished 1832), which became a focal point for battles about historical interpretation in the early twenty-first century because it was also the site of Washington’s slave quarters. 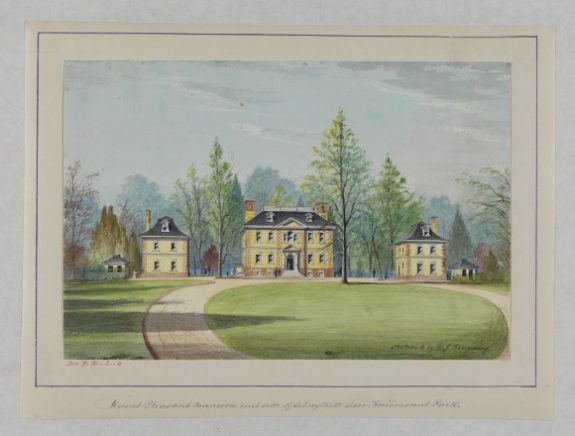 After the Revolution, mansions like that built for merchant, banker, and senator William Bingham (1752–1804), depicted in a view by William Birch (1755–1834) (q.v., 1789, demolished about 1850), highlighted new taste in architecture as well as the wealth of the new nation. Some townhouses swiftly made a transition from mansion to institutional use, such as the house at Thirteenth and Walnut Street designed for Thomas Butler (1778–1838). Not quite completed by the time of his death, by 1850 it had been acquired by the Philadelphia Club, serving as a familiar “home away from home” for the region’s elites, many of whom were beginning to own countrified suburban houses. Early country houses could be architecturally somewhat unrefined. Fountain Low (later Graeme Park), built for Sir William Keith (1669–1749) in the 1720s, for example, was noted more for its setting and landscape than its architecture. More distinguished and in keeping with transatlantic trends in building compact classical houses for professional and merchant elites was Stenton (1723–30), the country estate of James Logan (1674–1751) near Germantown. 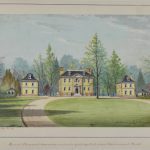 The Penn family remained influential in mansion building until the American Revolution: William Penn’s sons constructed their own houses and influenced others to build, as at Bush Hill (built 1740, demolished 1875) and Belmont (1742–50). A boom in mansion building occurred as Philadelphia became the largest and most important North American city before the Revolution, typified by the elegant Palladian mansion Mount Pleasant (1761–62) and the house of Pennsylvania Chief Justice Benjamin Chew (1722–1810) at Cliveden near Germantown (1763–67). The Chew mansion later served as a British fortress during the 1777 Battle of Germantown. Although large by colonial standards, in the wider British world before 1775 these mansions were considered modest in size, appealing particularly to upper-middle-class genteel families who comprised the colonial gentry. As complex social organisms, mansions hosted numerous inhabitants. Houses and estates supported not only those who built and lived in them, but they also required labor to sustain them. Workforces at pre-Revolutionary mansions often comprised a mix of free labor, indentured servants, and enslaved Africans. Later, waves of immigrants provided much of the labor needed to run and maintain these large and complex houses. Mansions symbolized power and status in material ways; the hierarchical social structure of their inhabitants also reinforced these messages. In the late nineteenth and early twentieth centuries, Philadelphia’s most noteworthy architects designed mansions for the city’s rising bourgeois and industrial elites, who coveted urban townhouse mansions located close to the services, clubs, and institutions they patronized as well as estates in the counties outside the city. The development of mansions on and around Rittenhouse Square began about 1840 and expanded westward for the rest of the century. Prominent among these was the Fell-Van Rensselaer House (built 1896–98), a Beaux-Arts masterpiece located at Eighteenth and Walnut Streets. 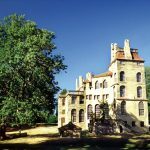 Mansions were sometimes the work of a quirky collector or designer, as in the case of one of the region’s more unusual mansions, Fonthill, a concrete castle built between 1908 and 1912 by Henry Chapman Mercer (1856–1930) in Doylestown, Pennsylvania. Following the development of the Pennsylvania Railroad in the nineteenth century, Philadelphia’s Main Line became a center of estate development and mansion building unparalleled in the region. One of its most prominent mansions, Ardrossan (1909–11) by Horace Trumbauer (1868–1938), a forty-five-room Georgian-style mansion, famously inspired the 1940 film The Philadelphia Story and shaped the perception of Philadelphia’s mansions and the people who inhabited them within popular culture. 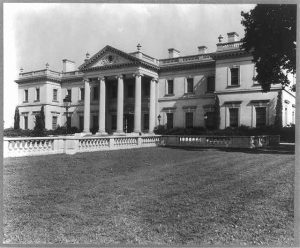 Another suburban mansion that drew particular attention was the one-hundred-thousand-square-foot Whitemarsh Hall in Montgomery County (1916–21, demolished 1980), one of the largest houses constructed in America. Additional regional nodes of mansion development included houses like those for the DuPont family in Delaware, such as Winterthur (1837–39, additions 1902, and 1928–32) and Nemours (1909–10). Active building of the largest mansions slowed dramatically after the Second World War. Many older mansions remained privately owned, while others became the focus of preservation efforts as the region’s historic infrastructure came under threat. Philadelphia-area elites continued to commission occasional architect-designed large private residences. The $80 million, thirty-seven-thousand-square-foot Alter Mansion (Arbor Hill Estate) designed by Rafael Viñoly (b. 1944) in Whitemarsh Township (1990s), which necessitated destruction of an earlier 1929 Normanesque Revival house, stands as a modern testament to the possibilities and pitfalls of mixing finance and architecture. A more pervasive form of late twentieth- and early twenty-first-century development was the “McMansion,” the large, suburban houses frequently built by real estate developers to provide housing to the region’s affluent professional and commercial classes that often have been considered lacking in architectural style and oversized. Mansions remained visible physical symbols of the Philadelphia region’s past into the twenty-first century. They served as monumental examples of a version of history focused on wealth, social status, and hierarchy and symbolize the ebb and flow of development in a large American city and its region. Stephen G. Hague teaches British and modern European history at Rowan University. His research interests center on social, cultural, and architectural history, and he is the author of The Gentleman’s House in the British Atlantic World, 1680–1780. Garrison, James B. 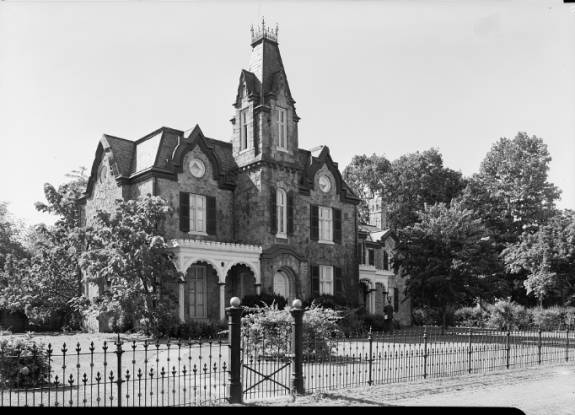 Houses of Philadelphia: Chestnut Hill and the Wissahickon, 1880–1930. New York: Acanthus Press, 2008. Hague, Stephen. The Gentleman’s House in the British Atlantic World, 1690–1780. Basingstoke, United Kingdom: Palgrave Macmillan, 2015. Kathrens, Michael C. American Splendor: The Residential Architecture of Horace Trumbauer. New York: Acanthus Press, 2011. King, Moses. Philadelphia and Notable Philadelphians. New York: Moses King, 1902. Lawler, Edwin. 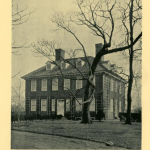 “The President’s House in Philadelphia: The Rediscovery of a Lost Landmark.” Pennsylvania Magazine of History and Biography 126 (2002): 5–95, and Lawler, Edwin. “The President’s House Revisited.” Pennsylvania Magazine of History and Biography 129 (2005): 371–410. Lidz, Maggie. The Du Ponts: Houses and Gardens in the Brandywine. New York: Acanthus Press, 2009. Morrison, William. The Main Line: Country Houses of Philadelphia’s Storied Suburb, 1870–1930. New York: Acanthus Press, 2002. Moss, Roger W. Historic Houses of Philadelphia: A Tour of the Region’s Museum Homes. Philadelphia: University of Pennsylvania Press, 1998. Reinberger, Mark and Elizabeth McLean. 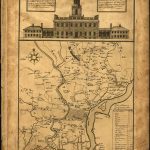 The Philadelphia Country House: Architecture and Landscape in Colonial America. Baltimore: Johns Hopkins University Press, 2015. Tatum, George B. Philadelphia Georgian: The City House of Samuel Powel and Some of Its Eighteenth-Century Neighbors. Middletown, CT: Wesleyan University Press, 1976. Chestnut Hill Historical Society Photograph Collection, Chestnut Hill Historical Society, 8708 Germantown Avenue, Philadelphia. Philadelphia Architects and Buildings, The Athenaeum of Philadelphia, 219 S. Sixth Street, Philadelphia. Manuscripts and visual materials, Historical Society of Pennsylvania, 1300 Locust Street, Philadelphia. Thomas Nevell’s day book, Special Collections, University of Pennsylvania, 3420 Walnut Street, Philadelphia. Architectural Archives, University of Pennsylvania, 220 S. Thirty-Fourth Street, Philadelphia. As home to over three hundred historic places open to the public in some form, Philadelphia has mansions well-represented as museums and relatively accessible. Although too numerous to list, a number of mansions exist in concentrations or are overseen by collaborative organizations. Representation is especially strong for the colonial period, but examples from a number of other periods are accessible as well. Andalusia, 1237 State Road, Andalusia, Pa.
Belmont Mansion, 2000 Belmont Mansion Drive, Philadelphia. Ebenezer Maxwell Mansion, 200 West Tulpehocken Street, Philadelphia. 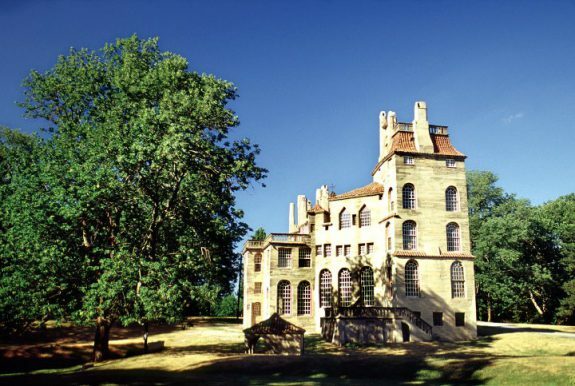 Fonthill, 525 East Court Street, Doylestown, Pennsylvania. George Read House, 42 The Strand, New Castle, Del. Graeme Park, 859 County Line Road, Horsham, Pa.
Grumblethorpe, 5267 Germantown Avenue, Philadelphia. Lemon Hill, Lemon Hill Drive, Philadelphia. Mount Pleasant, 3800 Mount Pleasant Drive, Philadelphia. Nemours, 850 Alapocas Drive, Wilmington, Del. Pennsbury Manor, 400 Pennsbury Memorial Road, Morrisville, Pa.
Stenton, 4601 N. Eighteenth Street, Philadelphia. The Woodlands, 4000 Woodland Avenue, Philadelphia.